Earlier today, HBO announced that Manny Pacquiao's dominant November 13th victory over Antonio Margarito generated a minimun of 1.15 million pay-per-view buys, resulting in $64 million in domestic revenue. This marks the third year in a row that Pacquiao was involved in a fight that generated at least 1 million buys. 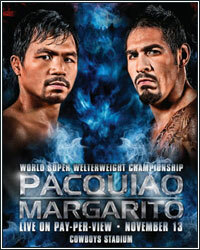 "We're thrilled with the PPV performance," HBO senior vice president Mark Taffet would tell Dan Rafael of ESPN.com. "This is the third consecutive year that a Manny Pacquiao megafight has exceeded 1 million buys and he has generated 5.1 million buys over his last five fights -- true measures of his PPV superstar status." The reported 1.15 million buys are only an initial figure, and those numbers are expected to rise once all regions are accounted for. Promoter Bob Arum was pleased with the performance considering the amount of negative press the match-up received prior to the fight. "I think the fight with Margarito did very, very well and we are constantly trying to figure out how to better our performances. Considering where we were when we announced the fight, nobody would have believed we would have done this," he commented. "Can we do more? Yeah. Nobody would have dreamed that you could take a fighter from the Philippines and make him into an iconic American star and we've been able to do that. Most of the credit goes to Pacquiao, but we've been able to do that and now we have to improve on what we've done."